Swing and chains without stand. We recommend our furniture be placed in a protected location, such as under an overhang or roof. Do not place your swing in the direct sun and rain. Stand only. Use in protected location only. Do not place in direct sun and rain. I absolutely love this swing. I have been looking for something like this for a while. I found your ad in Missouri Life Magazine. Do you Ship? How much is this swing? I am about an hour west of St. Louis. The swing with chains sells for $585. This is without the stand; you would suspend it from rafters on your porch, covered deck, etc. We do ship, but we will be in Clarksville next weekend (n of St. Louis). You could come to Clarksville to pick it up, or John could deliver it to you with just a bit for his delivery cost. If this would work for you, please let us know and we will work out the logistics. 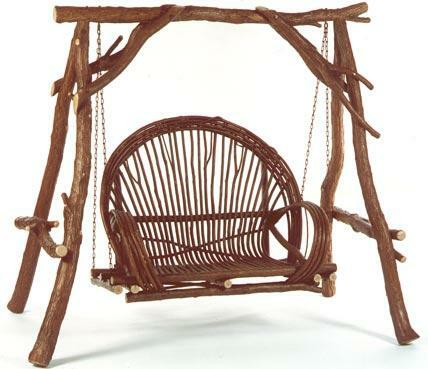 Thank you; these swings are beautiful, comfortable, and made to last. John has been doing this for 35 years and is very meticulous. You would not be disappointed! Hello, can you tell me the dimensions of this swing? Thank you!